Dubai: The chase for yields in Dubai is no longer about opting for one location over the other. These days, it is fast turning into sub-markets within a freehold cluster or even particular plots. For the launch of the new Kempinski Residences skyscraper on Wednesday, the brokerage firm handling the sales kept emphasising that 90 per cent of the apartments in the G+61 structure will overlook the Burj Khalifa. More recently, there was the launch of another tower, of the Marquise Square in the Burj Khalifa District, where the focus was on the sheer number of studio units it will have. The developer’s contention was that there was a particular shortage of this format in that particular part of the city. And the projected yields? A juicy 11.4 per cent. It is all part of a developing trend in Dubai’s real estate space — that of “localised price fluctuations within individual specific sub-market locations,” according to the latest update from CBRE, the consultancy. Selling prices remained relatively stable during the third quarter, with seasonality a possible factor in keeping it muted. But there were quite a few launches that took place in September, though these were mostly in the mid-market space. Apart from the Kempinski Residences, there may not be that many upscale launches scheduled for the coming weeks. Developers might be thinking of starting on a new slate from early 2017, giving the market more time to steady itself. In the third quarter, average rates declined by less than 1 per cent “underlining the gradual improvement in investor sentiment in recent quarters despite the ongoing pressure on rates,” CBRE reports. In the commercial space, a two-tier dynamic is becoming ever more apparent. “Secondary locations and strata impacted properties [are] typically facing declining rentals and rising vacancy rates,” CBRE reports. “However, prime locations and good quality accommodation — particularly in Tecom, DIFC and the CBD — continue to see rising rentals rates, amid tight supply and sustained demand from global corporate occupiers. Overall, the market is suffering from a dearth of good quality and efficient office accommodation available over contiguous floors, which is consequently restricting the movement of major corporate occupiers seeking consolidations from multiple existing locations into a single large premises. As a result we continue to see sustained pre-leasing activity, which is encouraging developers to commence speculative development starts. 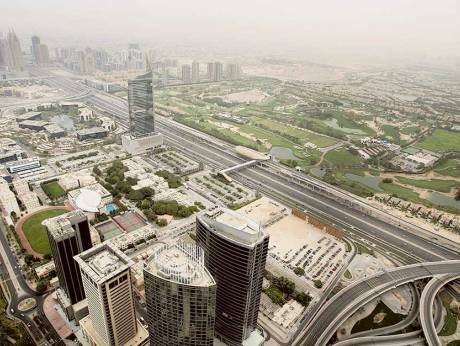 Average gross rentals for prime offices were unchanged at Dh1,920 square metre during Q3-16. But secondary rental rates “continued to decline, falling by around 3 per cent during the third quarter, reaching Dh1,072 per square metre.